“Wil many congratulations on achieving the 3,000 career run landmark. You must be delighted? I was quite pleased to get it out of the way. As I have played more games then anyone else in the club’s history it’s about bloody time. After a slightly slow start to the season, run-scoring wise, would you say the mark has been on your mind when batting? I had totally forgotten about it for the first game. It was only after you reminded me that it began to play on my mind. What has been your favourite inning(s) over the years? Any innings that helps to win a game. I don’t tend to remember good scores in losing causes. My first fifty against Haud Magnum was very enjoyable. Also a 48 against WICC at Nursery Road. I do fondly remember an inning of 18 against the Nomads in 2009. With the rest of the team throwing their wickets away against a very quick bowler (he broke a stump in half when he bowled Andy) whilst chasing a low score of 140, I managed to keep Naren off strike long enough to get us past the Nomads total. And favourite oppositions & grounds? I suppose the opposition I like are the one’s we’ve been playing for many years, Agricola, WICC and in recent years I have even enjoyed playing the Clapham Nomads. Chiswick and Nursery Road are probably my favourite grounds. Chiswick for it’s convenience and Nursery Road because I think I’ve scored more runs there than any other ground. What about your favourite shot(s)? Any straight drive gives me most satisfaction, but my favourite shot is the one that have gotten me the most runs over the years. The classy flick off my legs, though most Exiles would describe it as a paddle around the corner. And are there any bowlers who’ve been your nemesis over the years – who’ve frequently caused you problems and got you out – who you’d like to get your own back against in future? Three come to mind and two have fortunately retired from the game. Ken Price of Haud Magnum, John Morgan of Agricola and Emil Todorov of the Clapham Nomads. I’m always susceptible to comedy bowlers. Who have been your favourite Exiles team-mates to bat with over the years? My all-time favourite Exile to bat with was Bhau Patel, but their as been many others over the years. Of course there is my brother Sam. Still one of my most enjoyable partnerships with him was against North Croydon when he kept on thumping their aggressive young bowler to the boundary. The bowler almost had a heart attack. Basically I like batting with anyone who I just need to give strike to and let them get on with it. Mark Bradshaw was always a very re-assuring partner. Are there any Exiles batters you’ve tried to copy or learn from? I have never knowingly copied any other batsman, but I’m sure youngsters have been mesmerised by my beautiful technique and want to emulate me. You made your debut for the club in 1993 – do you remember your first innings? I think it might have been a midweek game on Wandsworth Common, but to be honest I only start to remember games from when I became captain. Only Naren Patel of current players – in 1992 – made his Exiles debut before you – what comments do you have about how the club has evolved over the years? Did you envisage the club would make it to the 20 year mark it’s celebrating this year? 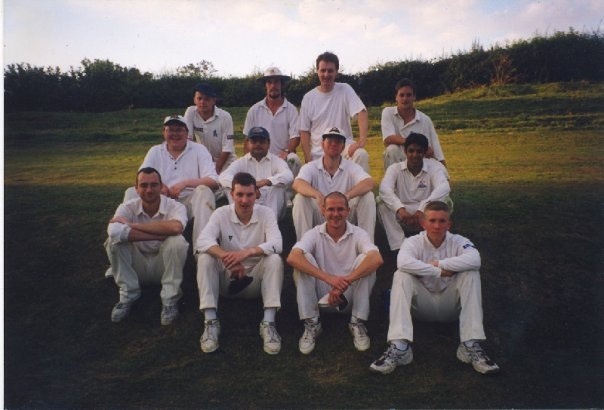 Whilst we have always had top-class players over the years I think we have improved as a team, but I don’t think you can beat the attached picture of a touring side from 1998, a team of Exile legends. What cricketing ambitions do you have going forward with the Exiles? To continue to contribute enough to the side to warrant selection. This entry was posted in Club News on 03/06/2012 by AndyWingfield. Exiles game against Surbiton Imperials on 3 June, due to be played at Nursery Road, has fallen foul of the weather. Hopefully better weather for next Sundays game against Whalers at Chiswick.